Australian scientists have invented a new ultra-thin device that can turn invisible light into the visible and change the colour of light, with the potential to be used to help turbo-charge internet speeds around the world. A change in light’s colour alters its frequency, which is a vital process in optical technologies including next-generation telecommunications. The new device could be developed in partnership with prospective industry partners to enhance the capacity and speed of telecommunication channels that are essential for delivering high-speed internet. Professor Wieslaw Krolikowski, one of the lead researchers from The Australian National University (ANU), said the device, which is a new type of nonlinear photonic crystal that is as thin as a human hair, was a major advance in the field. “Our device can produce different types of light and in different colours, simply by changing the angle that we shine a laser beam into the device, and it is reusable for different purposes,” said Professor Krolikowski from the Laser Physics Centre within the ANU Research School of Physics and Engineering. “This is the first time these feats have been achieved by scientists. 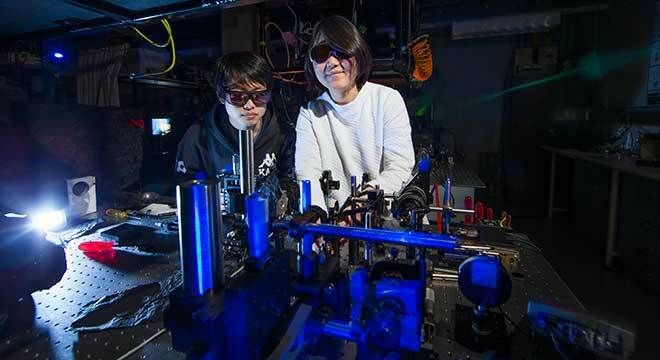 Co-researcher Dr Yan Sheng from ANU said the research team conducted numerous experiments by using ultrashort laser pulses to change the internal structure of a nonlinear crystal, which was able to convert an invisible light beam into visible light. “We provide the first proof that it is possible to engineer nonlinear crystals in three dimensions for the purpose of light conversion,” said Dr Sheng from the Laser Physics Centre within the ANU Research School of Physics and Engineering. The research team aims to make millimetre-sized devices that will be able to convert light much more efficiently. “We will also apply our technique to more popular and less expensive materials, making it more attractive to potential commercial partners,” Dr Sheng said.